Cervecería de MateVeza is a charming nanobrewery. This unique operation has also contract-brewed and packaged their flagship yerba mate infused beers for several years now. The tiny pub offers seven taps, often including guest taps. They offer a light menu of delicious empañadas. The feeling in this little storefront is cozy and social. Their small 20 gallon system allows them to make many “one-offs” that are often gone in a day or two. Make sure to check their website often for a schedule of special events that are generally a lot of fun. Extras: Cervecería de MateVeza is close to the popular Dolores Park. They will fill 32 oz cans (Crowlers) of their beers to enjoy in the park or elsewhere. 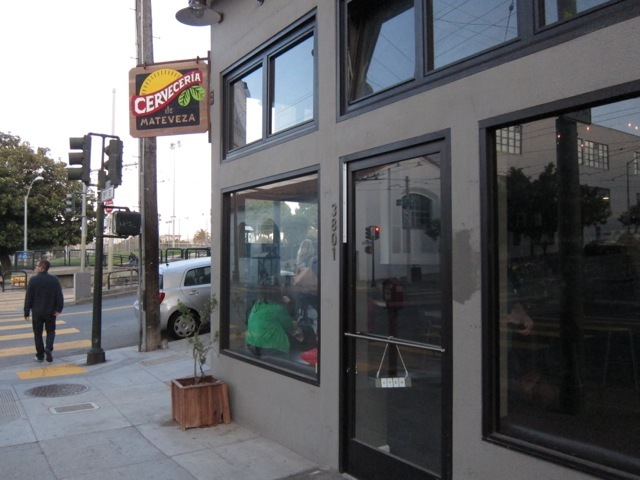 It’s also near several Mission District beer spots, and makes a great stop on a pub crawl. The South American herb, Mate (pronounced something like “MAH teh”), is a natural upper, so the house IPA and some of their other beers will give you the boost of caffeine and the soothing calm of hops in one concoction. MateVeza is not quite three quarters of a mile from 16th Street BART. You’ll enjoy walking west up 16th Street toward Valencia, turning left on Dolores, where you can peek at Mission Dolores, founded by Spanish explorers in 1776. Continue past the ornate old high school building to turn right onto 18th Street. Dolores Park is on your left for a block, then you’ll find MateVeza on the corner. There’s also a light rail stop for the J train a few steps from the little cafe, if you prefer to take MUNI. Official 16th Street Station and connecting transit info.